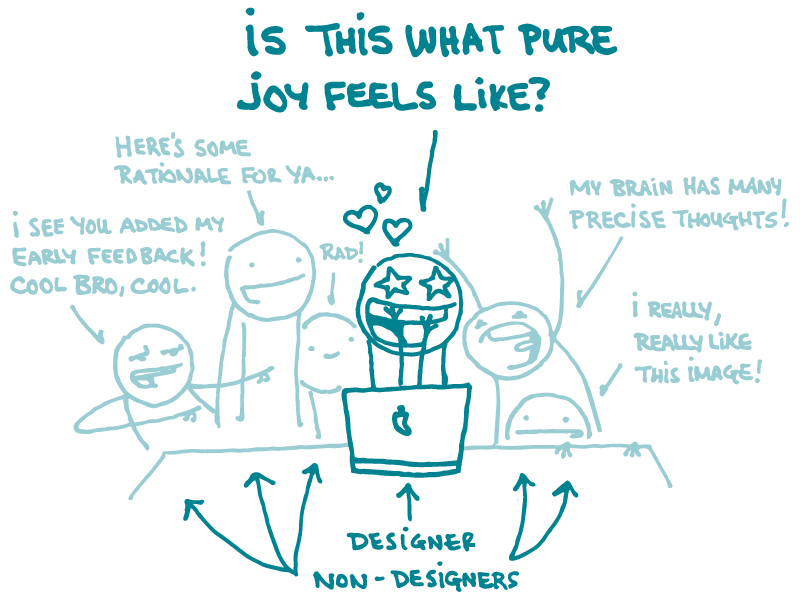 Alt: A designer doodle gazes with delight at a computer screen, and wonders aloud, “Is this what pure joy feels like?” A small crowd of non-designer doodles in the background are giving feedback on the design: “Rad!” says one. “I really, really like this image!” says another. We’ve talked from time to time about how important good design is for creating effective health materials. And, as it turns out, giving and receiving feedback is a crucial part of the design process. But discussing a design can be tricky if you’re not a designer yourself. That’s why this week, we’re bringing you tips for giving helpful and effective feedback to your more visually inclined colleagues. Give feedback early and often. By weighing in early in the design process, you help the designer know they’re heading in the right direction. In other words, don’t wait until most of the work is done to announce that you want to prettify your health content with icons instead of photographs. Keep it positive. Designers spend a lot of valuable time thinking through tons of different options before sharing the first draft of a new design. Keep that in mind and lead with positive comments—this tells the designer you understand how much time and effort goes into creating an original design. Identify the why. Resist the urge to simply state a solution (like, “Make the title font larger”). Designers also need to hear why you think a change is important. And when you explain your rationale, you give the designer an opportunity to apply your feedback to other aspects of the design, too. Get specific. It turns out that designers aren’t so fond of quips like “It doesn’t look right,” or “I’m not feeling these colors.” Before you make comments like those, think about which specific things aren’t working—for example, would you like the colors to look more vibrant or more subdued? This type of feedback will help the designer figure out where to go next. Ask questions. It’s okay if you don’t have a solution in mind—that’s why you’re working with a designer! Asking thoughtful questions can help create space for a new approach if it’s needed. In the end, if language fails and you just can’t get to the root of what you want, try sharing visual examples that show what you mean. (You can even take a crack at sketching something yourself!) Or get a second opinion from a colleague. Remember, effective feedback pushes work forward. It’s always better for the project—and the project team—to hear and consider different perspectives. The bottom line: Keeping design feedback positive and specific means a happier team and a better finished product.